워드프레스에 게스트북을 만든 사람들의 경우, 특정 Page를 만들어 두고 그 페이지의 comment 부분을 방명록으로 사용하는 경우가 꽤 많다. 나도 그렇게 사용하고 있긴 한데, 몇몇 삽질과 Paged Comments Plugin을 이용해서 따로 만든 페이지였다. 암튼 근데 누군가가 그 Guestbook을 쉽게 만들어 주는 Plugin을 내놨다. 1. Download the plugin from http://www.alleba.com/blog/wp-downloads/guestbook-generator.zip. If you don’t want paged comments, download this one instead. 4. Activate the Guestbook Generator plugin. 5. Go to Options > Guestbook Generator to create your guestbook. 1. 플러긴 파일을 다운로드 받는다. http://www.alleba.com/blog/wp-downloads/guestbook-generator.zip. 페이징 되는 코멘트를 원치 않으면 이 파일로 대신 다운로드. 3. 워드프레스 관리자 패널에 로그인 후 플러긴 관리 페이지에 들어간다. 4. 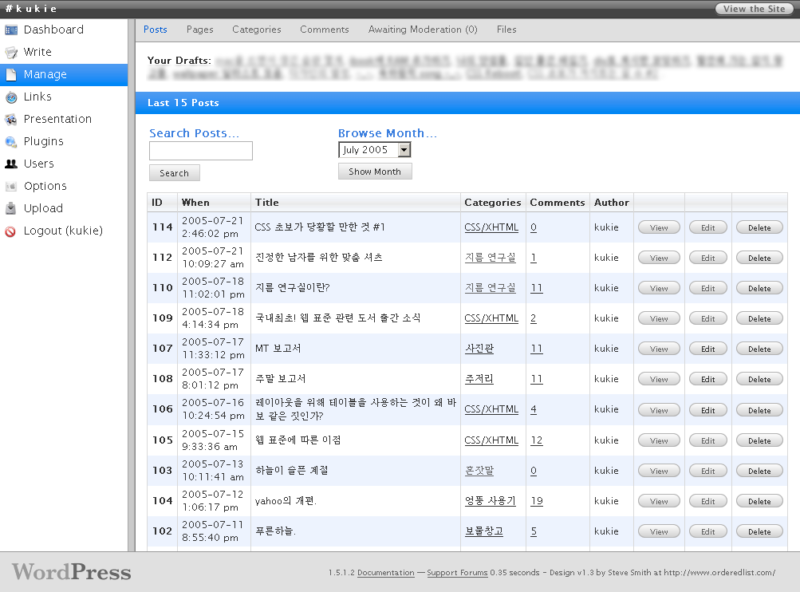 ‘Guestbook Generator’ 플러긴을 활성화 시킨다. 5. 옵션 > Guestbook Generator에서 당신의 게스트북을 만든다. 현재는 이 플러그인을 사용하고 있지 않음.